Cook up the flavours of Asia with our simple chicken san choy bow recipe. Prepare and cook in just 20 minutes. Serves 3-4. 1 Heat oil in a large saucepan or fry pan and brown chicken and mushrooms. 2 Stir in Seasoned Rice and water and bring to the boil. Cover and simmer gently for 10 minutes. 3 Stir through water chestnuts, replace lid and allow to stand for 2 minutes. 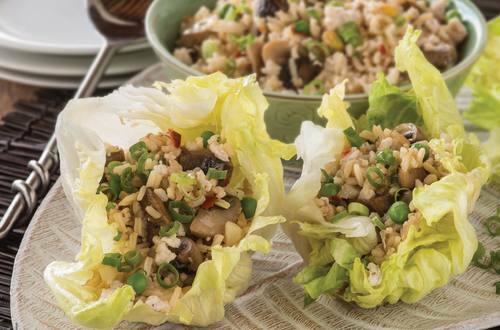 Serve rice in lettuce leaves and sprinkle with spring onions.